The day a Parrot flew into my room thru an open window, while I was in Bali on vacation, is a day I will never forget. It was the first of many events and revelations that I experienced while at my island retreat. One of the things that I took in that day was how well I appreciated the island décor that created a relaxing atmosphere. The only non-relaxing event that occurred was when the parrot flew into my room. It landed on top of the curtain rod then over to the dresser draws. It seemed frustrated and confused before it noticed the window was still open. This is how it made its escape from my room while my wife and I did everything to avoid it. The event with the parrot made me realize how relaxed I was. I had only been on the island near Bali for just a couple of days, but I noticed I was sleeping better and had a larger appetite at meal times. 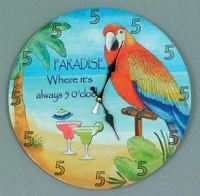 It seemed the island décor and the warm weather had helped the stress of living in the rat race to just magically melt away. This is when one of the biggest and life changing revelations came upon me. If I could recreate the island décor I was experiencing on my vacation in my home, I could better deal with the work related stress that was making my hair turn grey. I knew I could not bring the beach, the sun or the waves back in Minnesota, but I could make my home to appear like it was here. To help me do this I started to pay attention to the details of the décor around me. I stated with the meals and looked at the place settings and accessories. The salt and pepper shakers along with the napkins all had an island theme. These particular ones I first looked at had palm trees on them. In other restaurants they used the Bird of Paradise theme. Both of these fit the island décor of the restaurant. Those examples along with many others helped me to relax and feel at home while I was half a world away and helped to convince myself I could really do this. I then noticed little things like hooks in an island theme along with wall hangings and even serving utensils. All of them set up so the visitors would feel welcome and relaxed. When I returned from my vacation I started to make purchases of the little items I had noticed. These would help to make a subtle reminder to me that I was in a relaxing place where all of my worries would no longer exist. The more I purchased, the quicker I would become relaxed after a long hard day at the office. The use of Island décor really did change the appearance of my home and how I perceived it. This place I slept was no longer just a place I would visit between the days at work. It had become my escape from the confines of the cold north along with being a relaxing and inviting place to be.